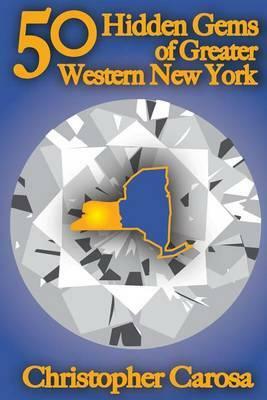 50 Hidden Gems of Greater Western New York : A Handbook for Those Too Proud to Believe Wide Right and No Goal Define Us. Discover the Secrets in Your Own Backyard. For too long the nation has dismissed the Greater Western New York region as a mere punch-line. That ends now. 50 Hidden Gems of Greater Western New York, in a light-hearted and entertaining manner, reveals some of the most delicious underexposed treasures our region offers. These people, places and events not only help define Greater Western New York, but have often helped define America as well. Don't, however, underestimate the power of this collection of witty stories. Rather than a mere historical review eulogizing the faded glory of what once was, 50 Hidden Gems of Greater Western New York take you on a expedition celebrating the rich character of our region. In doing so, the discerning reader will discover perhaps the most powerful hidden gem of them all: the key to Greater Western New York's future success. Along the Journey, You'll Discover: - A controversial early-American whose actions led directly to the creation of the U.S. Constitution. - Our region's claim to be the origin of America's favorite fast food (and, no, we're not talking Buffalo Wings). - The home of the Grand Canyon of the East. - The fascinating story of the mysterious Lost Tribe of Western New York. - A Rochester-born woman who holds this Hollywood first - that almost wasn't. - The truth behind the story of New York State's smallest town's eerie tragedy. - The time a small Western New York hamlet seceded from the Union - and its ensuing oversight. - How the bumbling British Monarchy helped mark the borders of Greater Western New York. By day, you might know Christopher Carosa as the oft-quoted President of the Bullfinch Fund and its investment adviser Carosa Stanton Asset Management, LLC. When he's not helping his exclusive group of clients achieve their lifetime dreams, he writes. The author of two books on investing, a stage play and more than 400 articles on everything from Modern Portfolio Theory to white cream donuts, Mr. Carosa has been a popular and entertaining speaker from coast to coast. Besides the local media, he has been interviewed and quoted in The New York Times, Barron's, CNN and Fox Business News. But what he enjoys most, though, is sharing the spell-binding stories of Greater Western New York hidden gems with area clubs, societies and organizations. Now, for the first time, he shares some of those same stories with fans, friends and followers of our region. Those willing to join him on his crusade to promote all things Greater Western New York are invited to visit GreaterWesternNewYork.com to learn more.